ColorSource PAR luminaires ship with a hanging yoke and a power cable with connector of choice. C-Clamps are not included. Choice of Black, White or Silver body color. 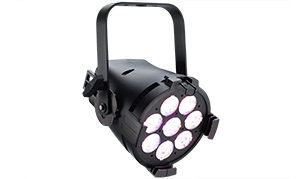 The ColorSource PAR luminaire is a high-quality and affordable alternative to cheap RGB or RBGA/W LEDs. The broadest color range possible from a four-color LED luminaire is created using a proportionate mix of green, blue, lime, and red LEDs. All ColorSource PAR luminaires are color calibrated for uniformity and compensate for droop while dimming smoothly and maintaining their color quality. ColorSource PAR fixtures are now available in two versions: original and Deep Blue, using an array that offers richer, more saturated blues and strong magentas in exchange for the more jewel-toned blues like sky or turquoise available in original ColorSource Fixtures.